Just Julie B's Stampin' Space: Star Album with Coordinating Card & Tag! Star Album with Coordinating Card & Tag! 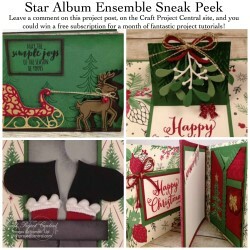 This set of projects is a gift set, photo album and home décor piece for the holidays, all in one. The Star Album has seven unique decorated panels and seven spots for photos. The wide variety of stamps, materials and techniques used make it an extra special gift or home décor item. Some of the panels are simple and others have a lot of detail, but they are all finely crafted to pair with your treasured holiday pictures. The coordinating tag and card can be given separately or the whole ensemble can be given as a gift to one special recipient. This awesome project was made by Melissa Kerman and you can get her tutorial when you subscribe to the month of October over at Craft Project Central. Check out the 2018-2019 Catalog! Subscribe to get exclusive ideas and updates by email! Thank You Rose for a Challenge! Warmth & Cheer Christmas Ornaments! Butterfly Basics Painted Tote Set! Paisleys & Poseys Card Set & Purse! Merriest Wishes Tags & Gift Box Set! Cookie Cutter Halloween for Class! Creation Station Blog Hop - To Die For!